In continuing to research the origins of the Moke I have come across a report in the National Archives on a prototype that appears to be a bit different from the rest of those built at Longbridge in 1959. Does anyone know what it is? I'm baffled! Better still does anyone have a chassis number for it? The chassis number will begin SPL and then be followed by 3 digits. 2. The grill is different. 3. The headlights are mounted lower. 4. The bumpers front and rear are mounted lower. 5. The instrument panel looks more like that of a normal Mini. 6. Under the bonnet the panel that runs behind the carb is totally flat. 7. It has 4 grab handles, not 3 as on other prototypes. 8. The rear grab handles are fitted on one end to the start of the slope of the rear wing. The other prototypes simply have them bolted down on to the side panel. 9. The rear subframe showing just fore of the rear wheel is different. I can't quite work out what is different but it is! 10. The air filter is very early (oil bath type?) and of the type fitted to the prototype Mini saloon. Are there any other differences I wonder? In fact could this be the very first Moke? I have an idea that these, or one of these photos, appeared in a book written by the motoring journalist, Jon Presnell. Am I right and if so what did he say it was? Who can solve the mystery?!! Last edited by 59Prototype on Sat Jul 13, 2013 16:25, edited 2 times in total. Re: Which prototype Moke is this? Hmm I must not have access to those sections of the gallery, your links only sends me to the first image in the public section. You've got the album set to private Graham. Do you want me to make it public? Do you want to sell your Moke? I have never seen one like that before Graham (yes, I can see the photos, admins rights) and, indeed, it does look rather ugly (easily passed off as a kitcar). And just when I thought I had seen them all. Very interesting stuff. Sorry guys. I've now set the photos to 'public' so you should now be able to see them. Chris. I have had another go and amended the URL details. Try it now. I'm probably not the first to say it but what a rigmarole it is to get images included in a post. Moderators and regular users of this forum will dismiss the comment as rubbish but they know the way round this forum like the back of their hand. Regretfully I don't. Before you say anything, I've used computers for over 30 years so I am no novice to them! I rest my case! What a nightmare! I've now tried again so see if this works. If nothing else it proves the point I was making in an earlier posting! Once I have obtained my MA in Moke Forum postings I am sure it will be a doddle! I may be completly off my rocker a bit, but those inner wings look an awful lot like round nose mini inner wings in profile. A very very early moke prototype built off prototype mini shaped pressings? It almost looks like it could take most of a standard mini bonnet. Patience is a virtue, or maybe she is a virgin, I can't remember! Anyway everyone now has the photos to look at. Going back many years it occurred to me that I had seen the Moke grill shape somewhere else and then the penny dropped, as presumably it has with many others. 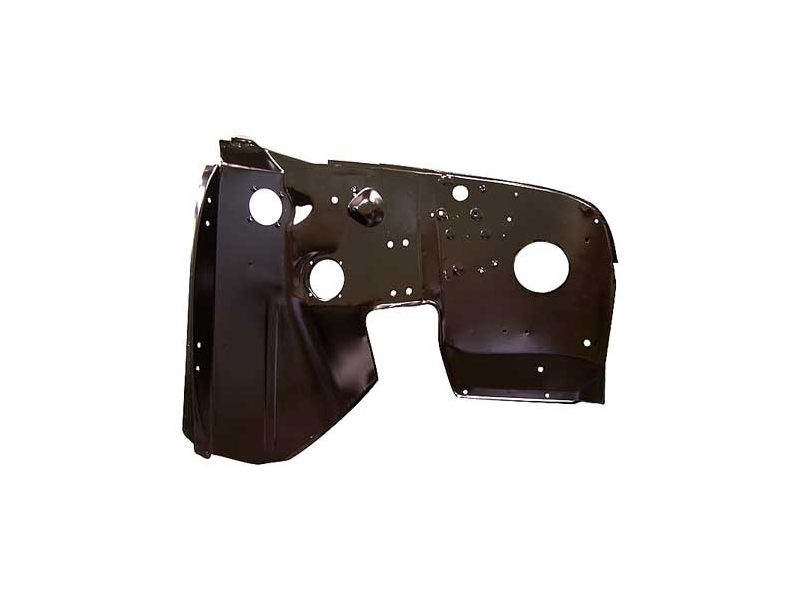 It is made using the same or very similar tooling to that for the early Mini (and Moke) radiator air outlet on the inner front wing. All they did was turn it through 90 degrees to it press out as the Moke grill. In fact didn't the very early Mini vans have a similar grill although in the case of the van it was part of the front pressing which made work on the distributor a little more difficult! The grill on this unusual prototype has a bit of an Austin look about it. A grill from a small 1950s Austin saloon perhaps? Incidentally if you ever think that the grill fitted to the 1959 prototypes was exactly the same as that fitted to the production versions from 1964 you would be wrong! Having bought a production grill many years ago I went to fit it to my prototype. It wouldn't fit! Nearly the same shape but not quite. One day I might get someone to cut and shut it to the required shape if that's possible, but it wouldn't be easy. The speedo housing looks a lot like a Mini one but maybe a bit longer? Its a bit of a worry because the earliest Mini ones were made of compressed cardboard. It certainly looks like it was much closer to the Mini in its thinking. The grille does look like the pressings in the inner wings, but its fairly different from that used on the 1958 prototype minis and the later vans. I would have to imagine this is somewhere pre-59 but post-orangebox... a prototype of the buckboard? Thanks to Dean, Chris and Tim for your input on this one but I'm surprised that no-one else has offered any other thoughts on this. I think, but I am not totally sure that the very first Moke prototype saw the light of day in early 1959. Other prototypes followed in 1959 through to around June that were essentially all made to the same spec but tweaked in various ways as ideas were tried out and adaptions made. It wasn't then until 1960 that more different versions started to be produced. It's said, but I have no proof, that the very first Moke was the donor for the original Twini Moke. That's the one that was demonstrated to the press in the snow (on the front lawn of Longbridge as it happens!) in January 1963. So here's the conundrum! If the photo of the Moke with the unusual bonnet, which is what this post is all about, was the first Moke surely it cannot have been the donor Moke for the Twini? Personally I think this could have been the original Moke prototype for the reasons I mentioned when starting this post but I really can't see it being the donor for the Twini. Just look at the work that would have been necessary to alter this one to get it looking like the later 1959 versions? If they were going to go to that amount of trouble to alter it all they might have well have started from scratch and built another one! One might argue that this strange bonnet Moke was actually made much later in 1959 or even 1960 but I don't go with this argument. The main reason for saying so is the air filter. By the time the Mini saloon was on the market (August 1959) the air cleaner had been changed to the round paper element type. So all in all was this the very first Moke and was the second one made the one they used as the donor for the Twini? Over to you Moke fanatics out there for your own thoughts on this poser!!! 59Prototype wrote: It's said, but I have no proof, that the very first Moke was the donor for the original Twini Moke. That's the one that was demonstrated to the press in the snow (on the front lawn of Longbridge as it happens!) in January 1963. Sorry, I'm not from UK... but how about this? It might not have been considered the first moke prototype because it didn't look very much like a moke? Maybe the two markings on it might lead to information? F.V.R.D.E. and 5950?